If you have some fresh fish and you are not sure what to do with it, cooking it in the deep fryer is always a good option. If you are unsure of how to deep fry fresh fish, it is not very hard at all; the most work that is involved is breading the fish. 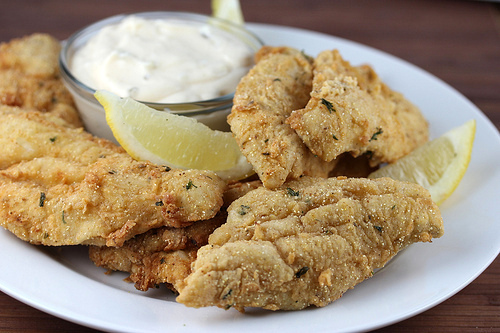 The fish is breaded in a flour, cornmeal, and seasoning mixture. You can add additional seasonings or adjust them to your taste. For example, if you want to add a little more heat, you could add more cayenne pepper. 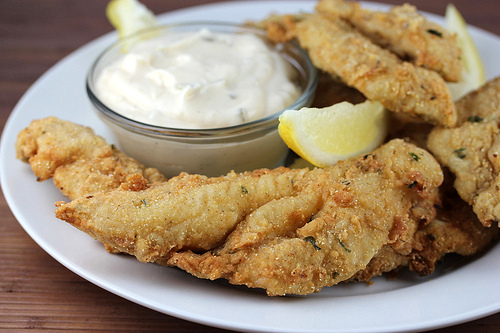 Also, when you are serving the fresh fish, having a good tartar sauce will help greatly. The tartar sauce is very easy to make, it combines ingredients such as mayonnaise, lemon juice, and sweet pickle relish. This recipe will work with just about any type of fresh fish—crappie, bluegill, perch, walleye, bass, etc. If you are looking for a great recipe for deep fried fresh fish, give this one a try. Enjoy. Heat oil in the deep fryer to 375 degrees. In a small bowl, combine mayonnaise, sweet pickle relish, and minced onion. Stir in lemon juice. Season with salt and pepper to taste. Cover and refrigerate for at least 1 hour before serving. In a shallow bowl or pie plate combine cornmeal, 1 cup of flour, salt, black pepper, onion powder, garlic powder, paprika, parsley flakes, dried oregano, and cayenne pepper. In another bowl beat together the egg and milk. Pat dry the fish fillets with paper towels. Put a ½ cup of the flour mixture into a plastic bag. Add the fish fillets to the bag and shake to coat the filets with flour. Dip the filets, one by one, into the egg mixture, and then dip into the cornmeal, flour, and spice mixture. Heat oil in a deep fryer to 375 degrees. Add the filets to the oil and deep fry in batches for about 2-3 minutes until golden brown and fully cooked (the internal temperature has reached 145 degrees). Drain on paper towels. Serve with tartar sauce. I love your use of cornmeal in the batter..I always liked to slip cornmeal in the batter when I deep fry calamari! It really depends on the size of the filets. You should always cook fish until it has reached an internal temperature of 145 Degrees F.